Check out the same group on "Miles and Monk at Newport" - also 1959, I believe. They really cook on that one. 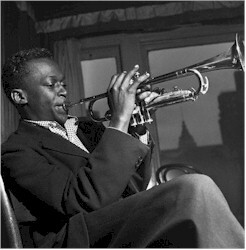 If you want to hear the way Miles revolutionized jazz trumpet playing, check out "Kind of Blue". It's still one of the top selling jazz albums (now on CD). Cannonball Adderly, Bill Evans, John Coltrane, Paul Chambers and Jimmy Cobb. Recorded in 59, it marked the change in Miles from hard bop to "cool".